The Lorex SG7117S Accessory Weather Resistant Color Camera Kit for Observation Systems is a high-quality and reliable camera designed for use with any Lorex, Sylvania and Home Sentinel black-and-white observation system. Suited to both indoor and outdoor use, this unit is protected by a weather-resistant ABS (Acrylonitrile Butadiene Styrene) plastic housing, and features built-in PIR (Passive InfraRed) motion sensors that automatically bring a trouble location to full-screen display. With IR (InfraRed) illuminators for low-light conditions, the Lorex SG7113S is ideally suited to home and business security applications or other situations requiring 24-hour monitoring, especially when motion detection is of major concern. 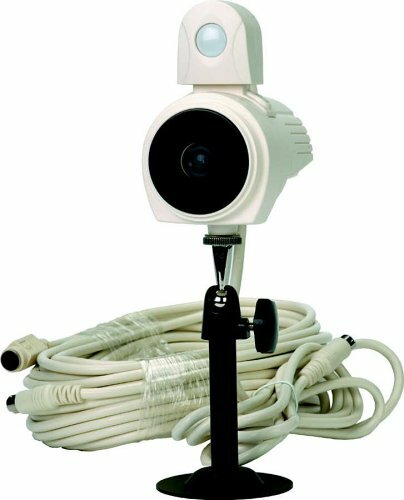 This accessory camera utilizes a 0.25-inch color CCD (charge-coupled device) image sensor, with a 3.6-millimeter fixed wide-angle lens that allows 510 by 492 effective pixels. The SG7113S has a decent resolution of 330 horizontal TVL (TV lines), and can receive a usable picture at no-light conditions (0 Lux) within the scope of its IR illuminators. The SG7113S features a built-in speaker and microphone to allow for two-way intercom-style audio. This unit is powered from the monitor via the connecting cable, and has an operating temperature of -14 to 122 degrees Fahrenheit. The Lorex SG7113S accessory camera is a great way to expand your Lorex observation system's coverage area. The weather-resistant housing on this unit is rated for protection against the ingress of dust and light rain. Quick and easy to install, this Lorex camera comes completely assembled and includes 63-feet of cable that allows you to place it almost anywhere. Users should note that the CCD sensor may become permanently damaged if exposed to long hours of direct sunlight or halogen light, so the camera should not be mounted or pointed directly at the sun or other bright-light sources. Lux rating is the measurement used to indicate how sensitive a camera is to light, and stands for the level of light reflected off a piece of paper by a candle from one meter away. Thus a sensitivity of three Lux would mean a camera could generate an acceptable picture of a piece-of-paper-sized object that was illuminated by the equivalent of three candles from one meter away. The lower the Lux level, the better the camera's ability to work in low-light conditions. The camera's resolution should be greater than or equal to the resolution supported by the system's recorder or monitor. The S/N, or signal to noise ratio, is an important measure of a camera's quality. A poor camera, low-light conditions or poor wiring causes "noise" which consumes processing power and disk space. A camera with a wide dynamic range is ideal, especially for recording areas in which both indoor and outdoor light are present. CCD (charge-coupled device) sensors provide high-quality images that are less susceptible to noise. CMOS (complimentary metal-oxide semiconductor) sensors offer less image quality, but are usually more cost-effective and energy efficient.